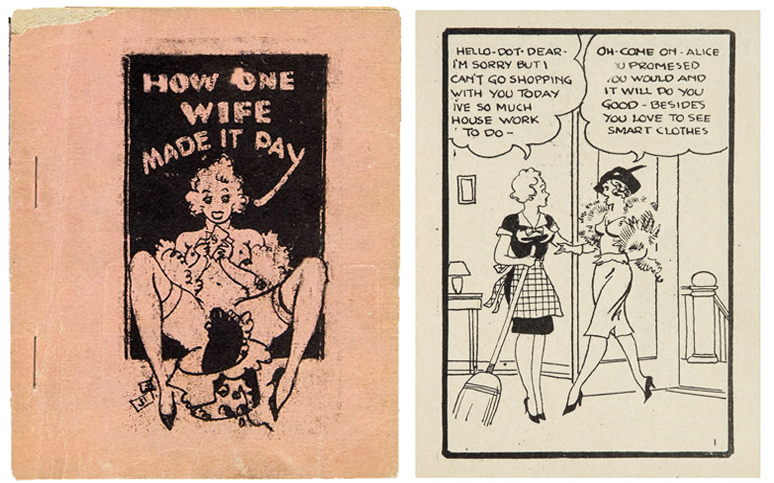 The Tijuana Bibles can best be described as the earliest version of the American comic book. They were produced in the U.S. from the 20s to early 60s, reaching their peak of popularity during the Depression. They were 4x6 inch booklets, eight pages long (hence, the nickname eight-pagers), printed in black ink on cheap white paper. In most cases, the artists are unknown. One exception is Wesley Morse. With titles like “She Saw the World’s Fair—and How!” and “She Ate A World’s Fair Hot Dog and Loved it”, Morse’drew on the bawdy, vaudevillian influence of comedians like W.C. Fields from his Follies days. The references to the 1939 World’s Fair make it easy to date his work. What he drew to pay the rent became the most widely circulated series of Bibles from that era. Here a few samples of Morse's Bibles.